Graphic above from NWS at 611 pm 30 June 2013 - very colorful indicating variety of things happening this afternoon. 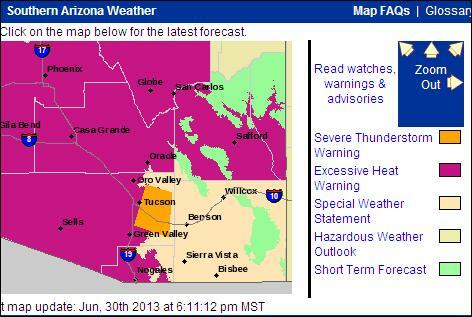 note the severe thunderstorm warning for the east side of Tucson. Below is the NWS TUS radar product showing VIL (Vertically Integrated Liquid) at the same time - values of 55 to 60 indicated for storm centered near Saugaro NP are quite high, especially for storms based just below 500 mb! 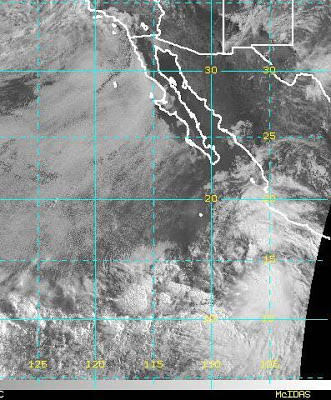 The IR satellite image above from 0530 pm shows significant MCS developing over Sonora. Below is 6:17 pm MST composite radar echoes from NWS TUS (added in an edit). Thunder reported currently at TUS, DM AFB, and thunder with rain here at house! Good day to return to Tucson. Appears that significant downdraft recycling of moisture into boundary layer will occur this evening and MCS in Mexico may trigger moderate surge of low-level moisture from GoC and northern Mexico. So many things coming together this afternoon. We have been on a road trip and have just now arrived back in Tucson. More on this later, but wanted to highlight TS Dalila. 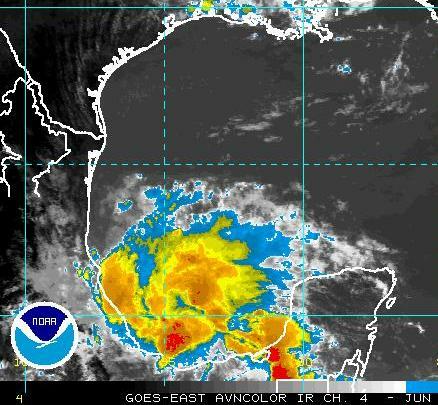 TS Dalia formed sometime last night and the NHC is issuing forecasts for this TS today - 30 June 2013. Above is current position and below is current NHC forecast. Dalila is forecast to remain a TS and to move slowly to the northwest and then turn westward. Dalila, as per Cosme is forecast to move close to the important area for tropical disturbances, if they are to trigger GoC surges of low-level moisture. Cosme did produce a weak surge that has continued moving some low-level moisture into southern Arizona since last Thursday morning. Dalila may well enhance this moisture advection in a few days. It is an interesting situation. 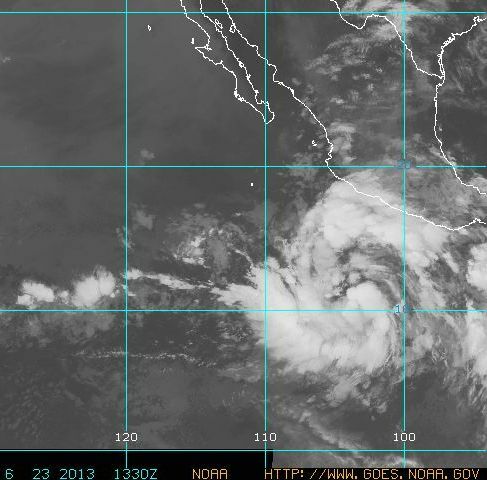 Below is a 21 UTC IR satellite image that shows both Dalila and also strong afternoon convection over Sonora, Mexico. The convection in Sonora could act to push some of the better low-level moisture, which lies just to the south of the borde, into Arizona tomorrow. this requires a substantial MCS to move toward the central GoC, producing a strong, cold outflow. So another interesting feature this afternoon. 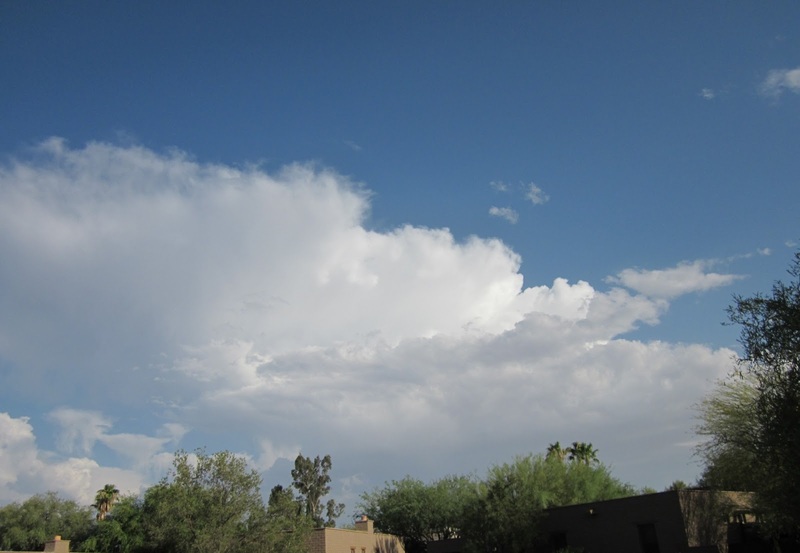 Yesterday afternoon there was widespread, high-based convection over many parts of Arizona. Widespread smoke was also obscuring the skies over large areas of the Southwest from a number of wildfires. Many high temperatures were broken - for example, Winslow reached 107 F, breaking the old record by 4 F. Tucson reached a high of 110 F.
Small amounts of CAPE continue to be present over much of the Southwest and the Tucson morning sounding is shown above. The wind flow is reasonably strong, and middle level temperatures are still cool. However, the lack of low-level moisture puts a serious constraint on convection, There is a distinct middle and low-level inverted trough moving into southeastern Arizona today, and there will be widespread anvil cloud again this afternoon. High-based convection, virga, downbursts, dust, and sprinkles of rain will again be the weather word for this afternoon. Just time for a quick post this morning (Friday, June 28th). First - the weak surge of low-level moisture expected from Cosme did indeed show up at Yuma around 7 am yesterday morning. It has not mixed out as quickly as I expected and it may have been deeper than I anticipated. 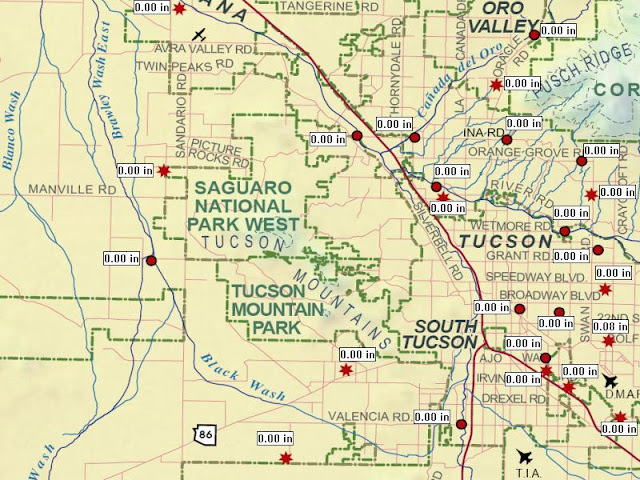 I see that dewpoints in low-levels increased some in Tucson also. The 500 mb analysis from NCAR RAL is shown above for 12 UTC this morning with the large, intense anticyclone centered over the Four Corners. A bit of middle level moisture is circulating around the anticyclone. The 12 UTC Tucson skew-T (below) indicates fairly strong easterly winds across southeastern Arizona above 600 mb. The sounding also indicates the increased moisture at low levels. A slight bit of CAPE is indicated above about 450 mb - ugh! So any mountain convection will be VERY high-based and pose the threat of dry lightning as the dessicating heat intensifies. Satellite image above shows several smoke plumes from wildfires in the Southwest, as well as deep convection in northern Mexico yesterday at 2340 UTC. The storms are lined up along and east of the Continental Divide, with the anvils blowing off toward the east to southeast. As the 500 mb anticyclone moves northward, the mid-level winds at Chihuahua shifted to the east and picked up in speed during the night. The 1200 UTC sounding from Chihuahua is shown below, with nice steering flow from the east toward Sonora. This was needed to get storms and outflows to move westward. So this is a positive sign for increasing MCS activity to the south of Arizona. This morning's NAM forecast for 500 mb valid at 1200 UTC on Saturday morning is shown below. Very ugly anticyclone is forecast to centered over northwest Arizona. The circulation around the high will try to advect some middle-level moisture from the Northwest toward New Mexico and Arizona. However, for a pattern such as this to become very active requires a significant push of low-level moisture into southern Arizona. If low-levels remain dry, we'll mainly see high-based, mountain storms with gusty winds and a threat of dry lightning. 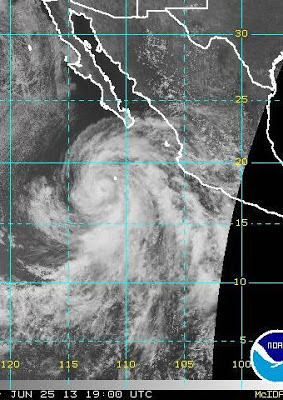 The NHC reported at 15 UTC this morning that Cosme had become a hurricane. The hurricane is shown in 19 UTC visible and IR satellite images above and below. 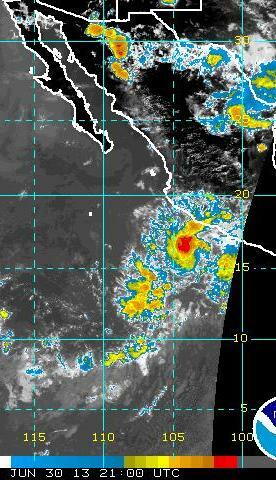 It appears that Cosme will not track far enough north to trigger a deep surge of mT moisture up the Gulf of California (GoC). However I do expect a shallow, short-lived, surge of low-level moisture to make it into southwest Arizona early Thursday morning. 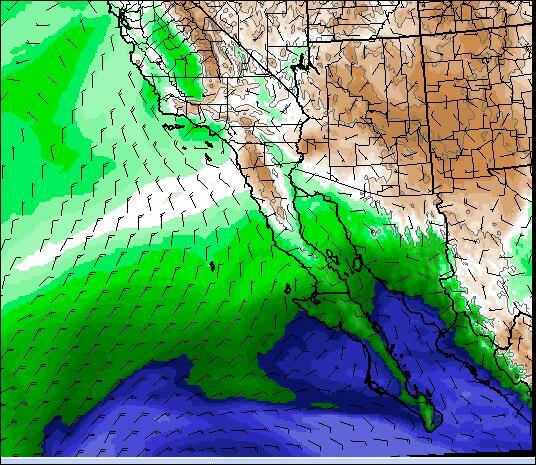 The graphic below is from this morning's 5.4 km forecast run of the WRF-NAM and shows precipitable water (PW) at 5 am MST Thursday morning. High amounts of PW will advance only about 2/3rds of the way up the GoC. It appears that convection and MCSs over Sonora will have to be the main main pushers of moisture northward during the next week or so, as they produce outflows over the central GoC and perhaps into southeastern Arizona. Tropical Storm Cosme is located off the southwest coast of Mexico this morning and the NHC intensity estimate is that it has maximum winds of about 50 mph. The current image above is IR from 1400 UTC and image below is visible from 1430 UTC. Cosme has a large cloud shield associated with it that extends north along the coast past Puerto Vallarta. The current NHC forecast for Cosme (above) is that will strengthen to become a hurricane, while tracking west-northwestward. The forecast track keeps it a bit too far southwest of lower Baja to create a significant, deep surge of tropical air up the GoC. This morning's NAM forecast indicates that the large size of the Cosme circulation will, however, produce strong winds and some convection over the southern third of the GoC. 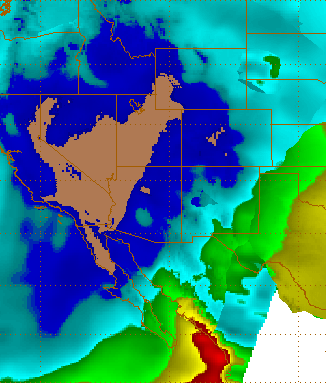 The graphic below is the NAM forecast of 10 m winds and precipitation valid at 5 pm MST on Wednesday. The key question is, assuming this forecast is reasonably accurate, what will the impacts, if any, be for southern Arizona? My current guess is that there would be enough disturbance over the lower GoC to initiate a surge of mT air northward. 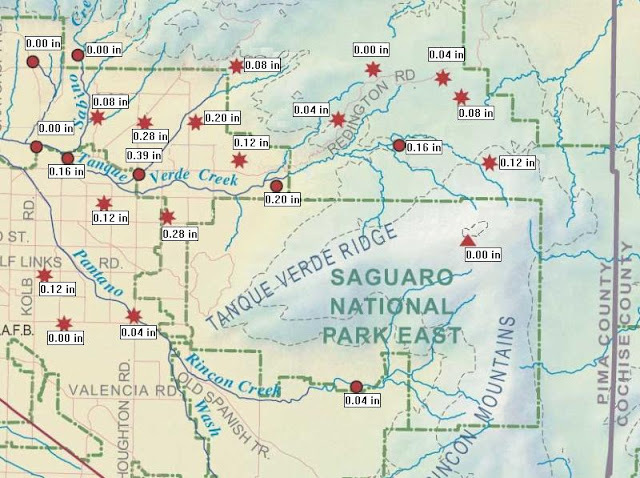 This surge would likely be shallow (coming into southwest Arizona late Wednesday or Thursday morning) and quickly mix out, given the brutal heat expected at the end of this week. 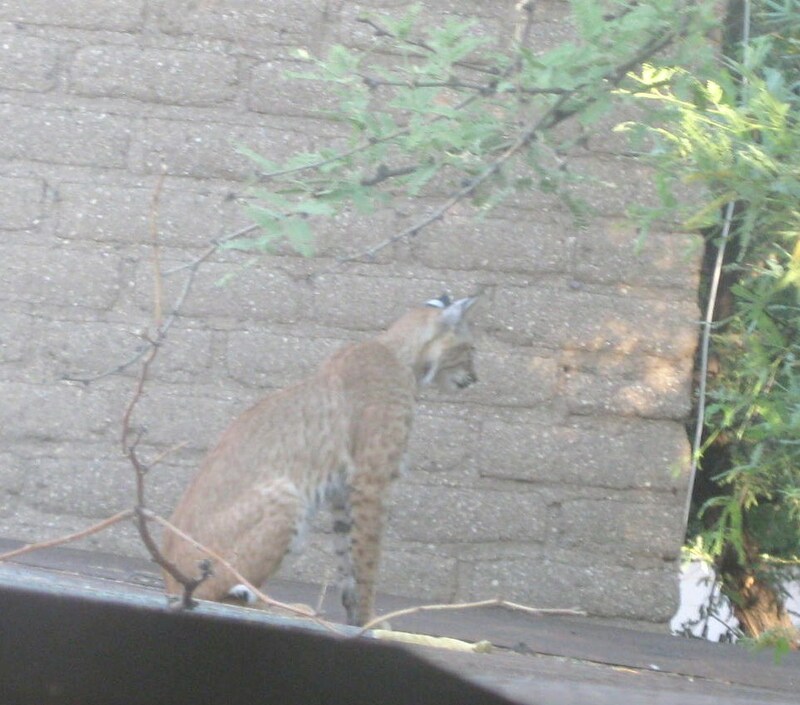 Our neighbor John Ferner took these photos of a bobcat at their place last evening, after they saw it get a rabbit in their yard earlier. When we came home late this morning the critter was stretched out in the shade, under my car, in the carport. 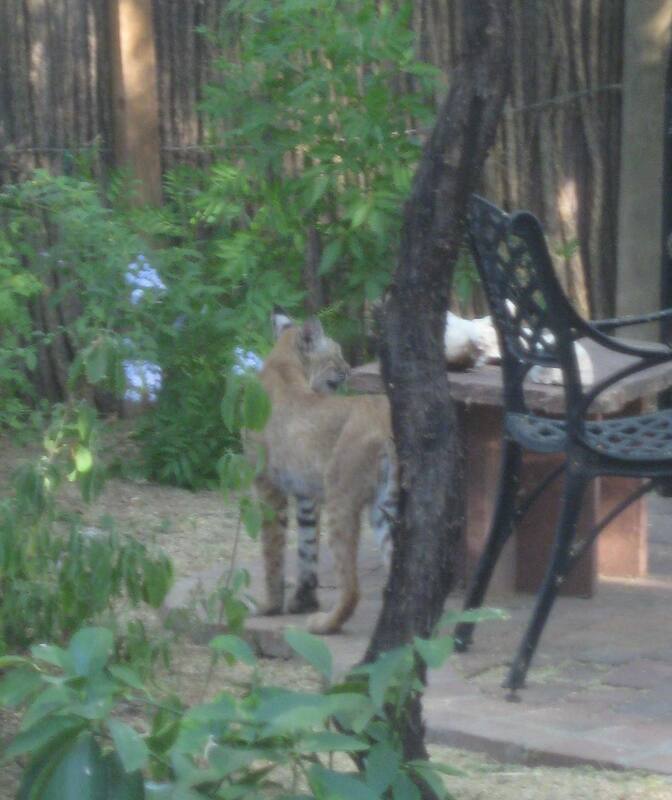 The heat and drought are so severe that wild life is moving into town. 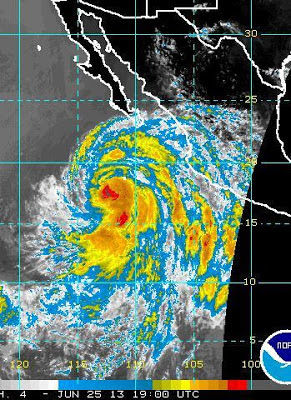 It appears that Tropical Storm Cosme has developed in the eastern Pacific - 1330 UTC raw IR satellite image above. The NHC will likely make this official sometime this morning. Cosme will be an important, wild card player in determining how southern Arizona weather plays out during the last few days of the month! Some readers may get a kick out of the certificate shown above. Note that they've transformed me into a retiree from the NWS. An interesting morning outlook from NHC today - Saturday June 22nd. chance of rain in the Four Corners today. That was the best odds of the summer so far. This made me wonder who first used the term “monsoon” to describe the summer thunderstorm season and attendant rainfall in Arizona and New Mexico. After considerable digging, it appears that “monsoon” was first used by Ronald L. Ives (1949) in his article: Climate of the Sonoran Desert Region (Annals of the Association. of American Geographers, 39:3, 143-187). I could be mistaken in this, but Ives’ Section: “The Sonoran Monsoon” does not refer to any previous papers. He primarily uses the character of the annual rainfall at different locations to invoke the use of monsoon terminology and mentions the winds only peripherally, referring to the seasonal reversal of pressure gradients driven by spring heating over the Great Basin. Ives also may be the originator of the “But it’s a dry heat…” He states the following about the Sonoran Desert: "Because of low relative humidities, sensible temperatures are tolerable, and complaints of summer season discomfort are heard largely from the obese, alcoholic, and neurotic components of the population." The seasonal wind change they refer is the monthly change in average wind direction at 500 mb from June to July. They then discuss the difficulties in determining whether or not a monsoon had occurred in any given year. They conclude that, from 1930 through 1954, 8 years occurred clearly with a monsoon and 12 years were clearly without a monsoon, while 5 years were indeterminate. Bryson (photo below from 1981) was a very well-known climatologist at the University of Wisconsin. 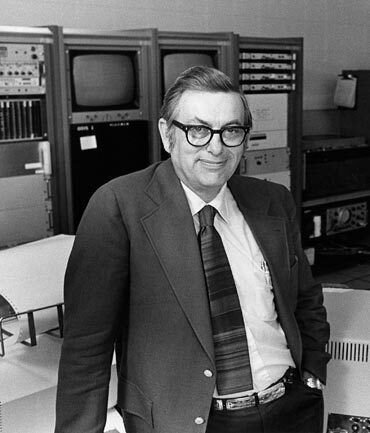 He spent a year visiting at the University of Arizona in the middle 1950s, which led to his research on the summer rains here. Obviously, there has been some degree of confusion regarding the “monsoon” continuing through the decades. If anyone is aware of an earlier work that uses "monsoon" for this part of the world, please let me know. The summer solstice for the Northern Hemisphere occurred last night, so summer is "officially" here, and the sun will now start retreating southward for the next six months. Here in Tucson real summer started weeks ago and we have now had 21 (counting today) straight days with highs over 100 F. The graphic below (from CIRA at Colorado State Univ.) shows blended PW at 5 am MST this morning (21 June 2013). The important mT air mass covers the south half of the Gulf of California (GoC), with PW amounts ranging from 30 mm (bright green) to over 50 mm (reds). To get the deep moisture up into Arizona requires some weather feature to push this air mass northward up the GoC (referred to as a Gulf Surge). So this is what we'll be watching for the next week or two. The global models strengthen the subtropical anticyclone northward during the latter part of next week - the ECMWF 500 mb forecast valid at 5 pm MST next Thursday (the 27th) is shown above. The ECMWF forecasts a large area of the West to have 500 mb heights over 5940 m - definitely summertime heights. However, the model also forecasts the air at 700 mb at that time to remain quite dry over the Southwest - see below. The same forecasts from the GFS are shown above and below. The GFS 500 mb forecast is very similar to the ECMWF, with the strong anticyclone at 500 mb centered over Grand Junction, Colorado. The winds at 500 mb are forecast to be easterly to northeasterly over southern Arizona and New Mexico - this easterly flow regime would probably bring in some mid-level moisture and fuel more high-based, mountain thunderstorms with the threat of more lightning but little rainfall. 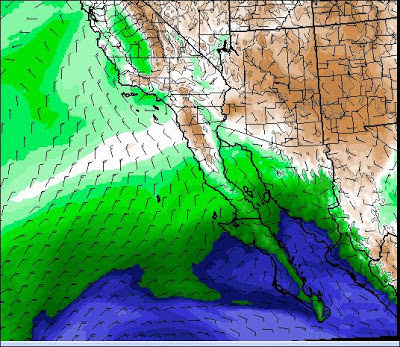 The GFS forecast at 700 mb for the same time also forecasts continued dry air over the Southwest and northern Mexico. Note, however, that the models don't forecast moisture changes well, especially at this long time range. The important unknown at this time is whether or not the forecasted tropical storm southwest of Baja (if such a storm actually develops) will come close enough to Baja to initiate a Gulf Surge of low-level moisture into southern Arizona. Events like this forecast tropical storm are often the trigger for the onset of the actual monsoon at lower elevations of the Sonoran desert - so we will have to watch all of this closely. Tropical Storm Barry is heading west toward the Mexican Coast this afternoon - above is 2015 UTC IR image and below is current NHC forecast. Looks like the NOAA Seagull is in danger of a direct hit. 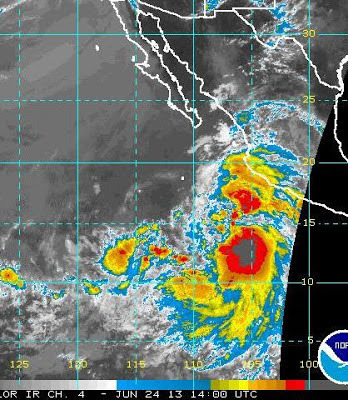 Eastern Pacific Tropical Activity In The Long-Range? First, the strange dewpoint temperatures yesterday afternoon did reflect a drying out that the instruments apparently had trouble with because of the very low RH values. The drier air led to a markedly cooler morning here at the house, with a low temperature of 62F - almost 10 degrees cooler than yesterday morning. Air down along the Rillito Wash was even cooler - very pleasant at sunrise. The long-range forecasts from the Global Models have been interesting for the past few days. Some of the model variants have been forecasting a TS or Hurricane moving just southwest of Baja. The graphic above is from one of the GFS ensemble members - valid at the end of next week. There are now nine of the GFS members forecasting something similar out at 8 to 10 days - will be interesting to watch. Note that the forecast above, were it to actually verify, would bring a major, deep surge of mT air northward into the Southwest. ASOS may be having some heat stress - temps have gone flat and dewpoint is jumping around - note the -28 F value observed a bit before 2 pm. Edited to add atmo time series: Things are very noisy at atmo too. The above is from the PSU Ewall and shows the maximum temperatures yesterday over northern Mexico and the Southwest US. 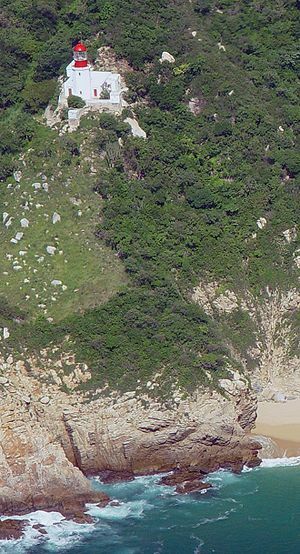 High temperatures around Cabo Corrientes on the Pacific coast were more than 20 F cooler than those recorded in the low elevations of the Sonoran Desert. Graphic shows nicely the extent and intensity of the differential thermal forcing that is in play this time of the year. The 103 F shown for Tucson is the high at DM AFB, while the high at the airport was 105 F. Tucson has now had a string of 18 days with the high temperature over 100 F. Shown below is the lighthouse at Cabo Corrientes. 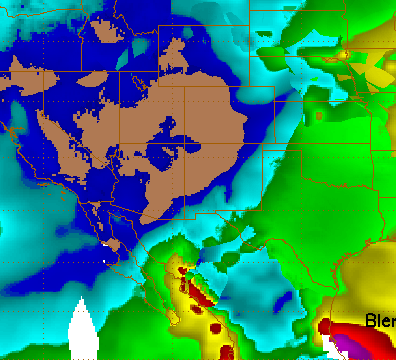 Above is the early WRF-GFS forecast from this morning (Tuesday, 18 June) on the 5.4 km grid for total rainfall through 5 am MST on Friday the 21st. Basically nada for almost all of the Southwest. So it goes. Mostly all quiet across southeast Arizona on Fathers' Day, although there were a couple of lightning strikes in Cochise County right along the New Mexico border. Satellite image above at 6:15 pm MST on Sunday evening shows Arizona mostly clear, with thunderstorm activity shifted east into New Mexico. The blended PW product from CIRA at Colorado State (below) shows that very moist mT air has retreated to the south end of the GoC. Another hot and dry day on tap today - graphic below at bottom shows the early WRF-GFS forecast of PW valid at 5 pm this afternoon with values at and below 12 mm - only 8 mm forecast at Puerto Penasco on north shore of GoC. There were more thunderstorms around yesterday afternoon, mostly from the east side on to the east and north, as the 5 pm visible satellite image above shows. There was also a considerable increase in cloud-to-ground lightning strikes yesterday - see CG plot below. The storms to the east did push an outflow westward across much of Tucson and the clouds developing along this kept my hopes alive for storms developing overhead but it was not to be. Here at the house we had a tiny spit of drops around 12:30 pm MST and a nice smell of rain later in the afternoon. Mike Leuthold reported lightning, thunder, and 0.30" at his location in the northeast foothills area. TUS and DM AFB both reported thunderstorms again, but with only a trace at DM. 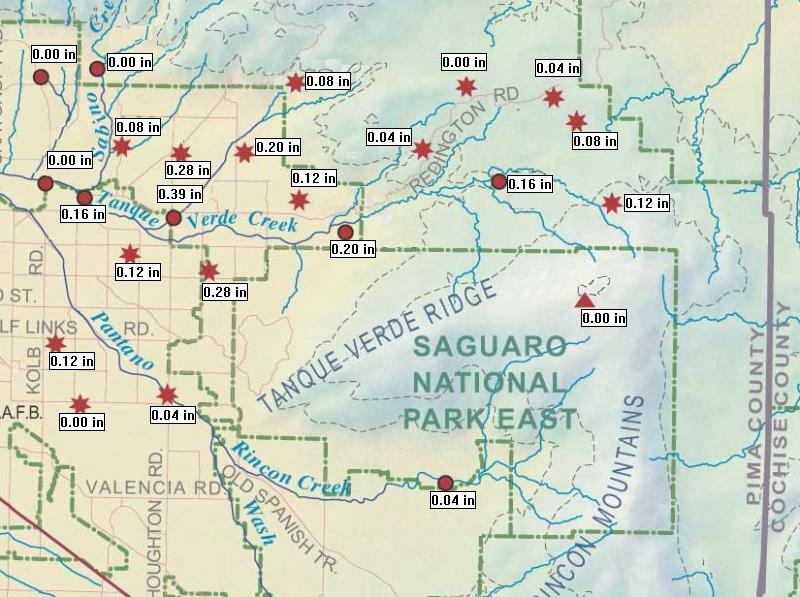 The ALERT network had 25 of 93 sites with measurable rain and 4 of these had 0.25" or more - mostly higher elevation and east side sites. This was the biggest "weather event" in eastern Pima County since May 5th. 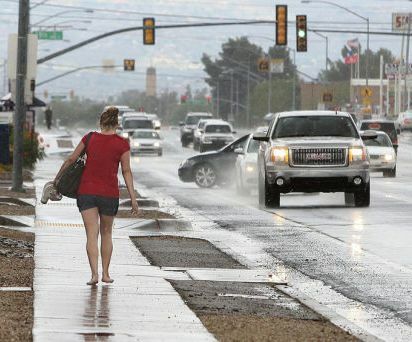 Photo 2 below is from the Arizona Daily Star this morning, showing there was enough rain on the east side to wet the streets (photo by A. E. Araiza). 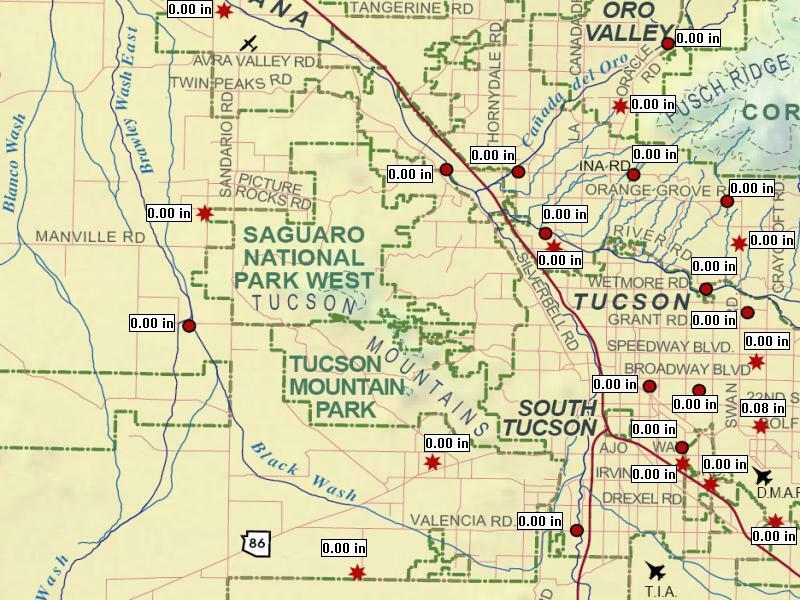 The two plots here show how the storms kept to the east - above shows rain yesterday at ALERT sites over east metro, northeast foothills, and the Rincons while plot below shows almost nothing over most of metro Tucson and the west side. The graphic below is forecast from early WRF-GFS of composite radar echoes valid at 1 pm this Fathers' Day afternoon. This is as good as the model can do, as drier air moves in from the west and northwest. So, the mid-June, pre-monsoon moisture blip has done its thing, and we'll suffer through another week of 100+ heat here in Tucson (and of course, even worse conditions in Phoenix). First summer thunderstorms in the Tucson area yesterday (Friday June 14th) with TUS and DM AFB both observing thunder but no rain. Four stations in the ALERT network (93 stations) had measurable rain with Haystack Mountain (far east part of network southwest of Benson) reporting 0.35". Art Douglas reported thunder, 0.10, and some hail in Ash Canyon south of Sierra Vista. the Carr RAWS station a bit north of where Art is had 0.29". The graphic above is TUS composite radar chart a bit before 3 pm and photo below was taken looking south from the house toward the airport at about 5:30 pm MST. 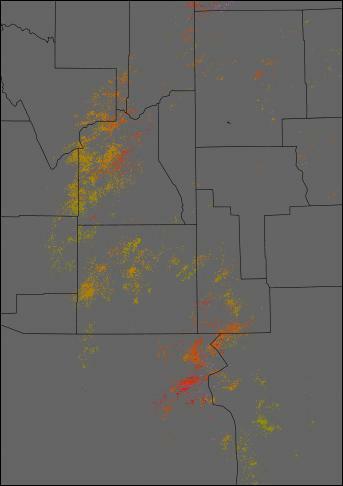 The bottom graphic shows lightning CGs detected in southeast Arizona yesterday - so a lot of lightning but isolated showers. Some lightning was visible to the south-southeast from here just after dark. Slightly more PW today with a continued deep boundary layer. The early WRF-GFS forecast is similar to yesterday, indicating high-based sprinkle storms and gusty winds likely across southeast Arizona.